Pamela Nave fell in love with music as a 3-year-old, when she became fascinated by the popping sounds she could create with a punctured drum set. Now, as associate professor of bands and percussion, she works to foster a passion for music in Purdue students as the head of the percussion department and director of several percussion-based groups. Nave is the director of Gold and Black Sound, the spirited pep band for Purdue's women's basketball team. 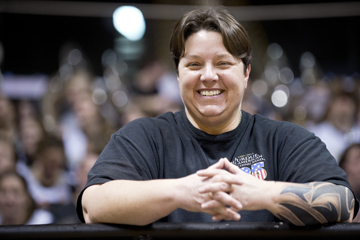 Also, she is the only female drumline instructor in the nation. I think I enjoy my job because I love the students in my programs. There isn't a music degree available at Purdue, so I'm around students who are playing simply because of their passion for music, even though it is not related to their career. I love being able to give of myself musically. I feel that, because I have a talent for music, I have a responsibility to give away my gift; through playing at Purdue or in the Lafayette community, giving lectures or teaching lessons, I'm able to share what I can do with everyone around me. As the director of Gold and Black Sound, how do you feel the band influences the women's basketball games? We don't have a very big student section for the women's team yet, so if the band isn't cheering it can be nearly silent in Mackey Arena. We control the environment of the games by engaging the crowd and keeping up the energy even when we're not winning. I take pride in the fact that Gold and Black Sound is a classy, clean, and strong group. We never cheer against our opponents, just for the Boilermakers. While I know it's about competition, it's also about respecting each other. Still, we create one of the most difficult environments to play in, and I've been told before by opposing coaches that we do get into our opponents' heads. How do you feel music affects the Purdue experience? I think our music brings life to campus, whether it's when we're marching down the streets, playing at the games, practicing outside, or when our concert bands are playing in Elliott Hall. Music is important to everyone -- and you can see that by how many people listen to it at work, on the way to school or in every other part of the day. I think without music and art in our lives, we'd all be pretty dull people. For the students involved, I think our programs are a great way for them to relax after a stressful school day and see their friends. Music is also their passion, and typically something they've been doing for their whole lives; it's part of who they are. One of our biggest challenges is creating an understanding between academic advisors and the music programs. All of Purdue's musical groups are extracurricular, and I hear from many incoming freshmen that their advisors tell them they won't have time to play music with us, that they'll have to spend that time studying. While I understand that music is a huge commitment, I do believe that it teaches students to budget their time, stimulates their creativity and gives them a release from the stress of school. I hate to see students leave Purdue with regrets because they weren't able to play music -- or follow whatever passion they have -- because they thought they had to sacrifice it completely to study.